Have a large event coming up and need to get all your logistics organized? Use this event budget spreadsheet to successfully manage your upcoming party, conference, or other event! This event budget spreadsheet will make planning your next event a snap, no matter the size. This is one of our most popular templates and it’s available to download instantly for free! Planning an event can be complicated—and expensive. With this budget template, you can specify how much you want to spend on individual parts of your event, like refreshments, decoration, and publicity. By breaking expenses into these convenient categories, this event budgeting template can help you see exactly where you are over or under budget. The template features space to record your projected budget as well as your actual expenses, for easy comparison. 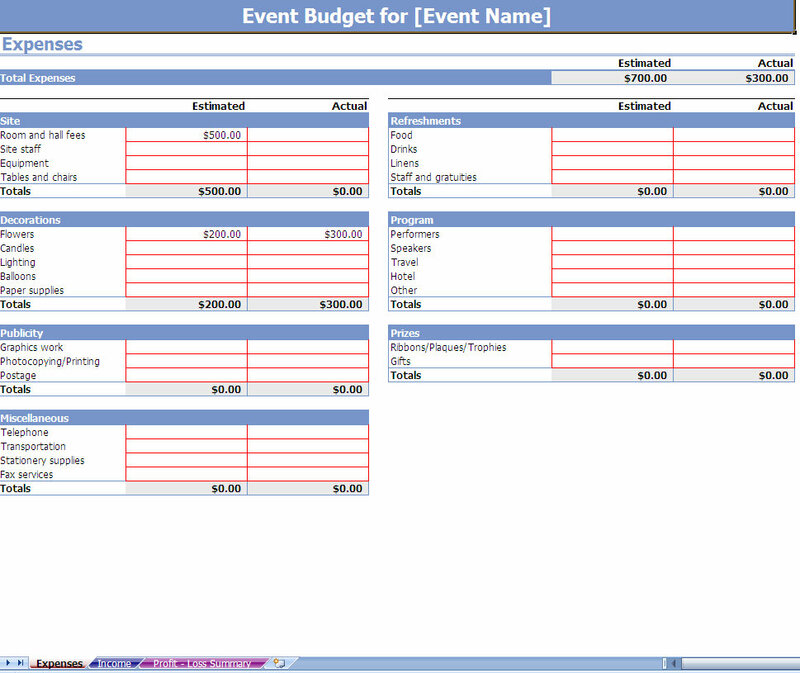 The event budget template from Microsoft Excel that is showcased on this page is very easy to use and comprehend. This Excel event planning template specifies many possible components of a party or event, so you can be sure you don’t leave anything out of your budget. It really is a convenient, easy way to track both expected and real expenses, so you’re never caught off-guard by an unexpected cost. The event budgeting template also serves as a calculator, so most of the hard work and heavy lifting will be done for you automatically. 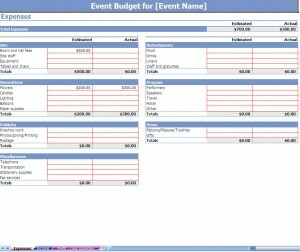 Be sure to download this event budget spreadsheet before planning your next event. If you love this Excel template as much as we do, please share with your friends and spread the word on Facebook, Twitter or Stumble Upon! It’s just one of the hundreds of templates, calculators and spreadsheets created to help make the day-to-day operations of life a bit easier on you, your co-workers and your family.